Hi! I am Sam Stippich, and I am a senior this year at St. Charles East High School. 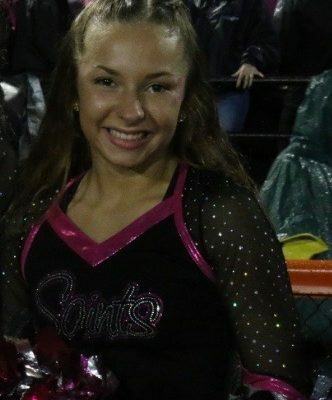 I am a member of the Varsity Dance Team, as well as Student Council Senior Class President. Starting 25 years ago, the St. Charles East and North Drill Teams began raising money for cancer charities. This is my fourth year being involved in Kick-a-Thon and I couldn’t be more proud of what we do for cancer patients and their families. Last year we raised $66,700 for a total of $1,134, 378 over the last 25 years, and we are hoping to raise even more this year! Every year, our community helps us raise money. Kick-a-thon donates every penny of that to the American Cancer Society, Living Well Cancer Resource Center, Fox Valley Food for Health and our Dance Teams. In order to reach this years goal, we are trying to spread the information of Kick-a-Thon to the whole community, so we can kick cancer together. It would be tremendously appreciated if you would donate to Kick-a-Thon. The proceeds from your donation will go to local organizations on the front lines of the fight for a cure, as well as support cancer patients. This is my last year on the team and my goal is to raise more money than I have in the past 3 years. Donations made online require use of a credit card. Kick-A-Thon is assessed a fee for processing of credit card donations per transaction. Consequently, the amount of the fee will be deducted from your donation. To avoid any bank fee, you may make your donation by check (Choose Offlne payment and check made to Kick-A-Thon) in person to the kicker you are sponsoring or by mail to: Kick-A-Thon, P.O. Box 3563, St. Charles, IL 60174. If you want to contribute enough to cover your intended donation amount plus the credit card fee, use this calculator. Thank You!! Make a check payable to "Kick-A-Thon"
On the memo line of the check, please indicate what kicker you are supporting.